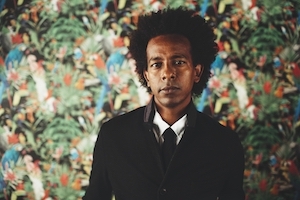 Gili Yalo is launching a solo career in a new project that combines Ethiopian roots with Soul, Funk, Groove, Psychedelic and Jazz music. Gili who has collaborated with top music producers Beno Hendler (Balkan Beat Box) and Uri Kinrot (Boom Pam) incorporates sounds from traditional Ethiopian music with contemporary music production. The result is a rich, vivid, exceptional melody accompanied by Gili’s unique voice with lyrics in both English and Amharic. The music made by Gili embodies his own personal story, which inspires the rhythm and the flow of this whole music project. During Operation Moses, a mass migration of Ethiopian Jews fled from their native land on foot to refugees camps in Sudan. Together with his family, Gili walked through the desert towards the promised land and sang to his beloved ones. In the course of this exhausting and emotional journey it was the music which encouraged Gili and his family to keep on moving. The motif of this ‘movement’ is apparent when listening to Gili’s music, starting from the groove, beat and flow, and up to the lyrics, concept and style of the project. The music goes beyond its own limits by exploring ways of creating new meaning to traditional Ethiopian music. Gili’s way of expressing his personal story through an advanced music production represents his own personal triumph.